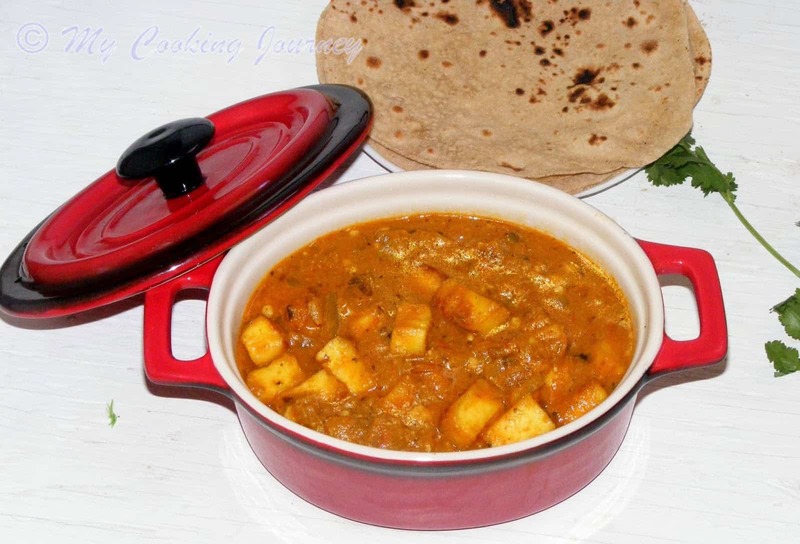 I love paneer in any dish and now days I substitute most of my paneer dishes with tofu. 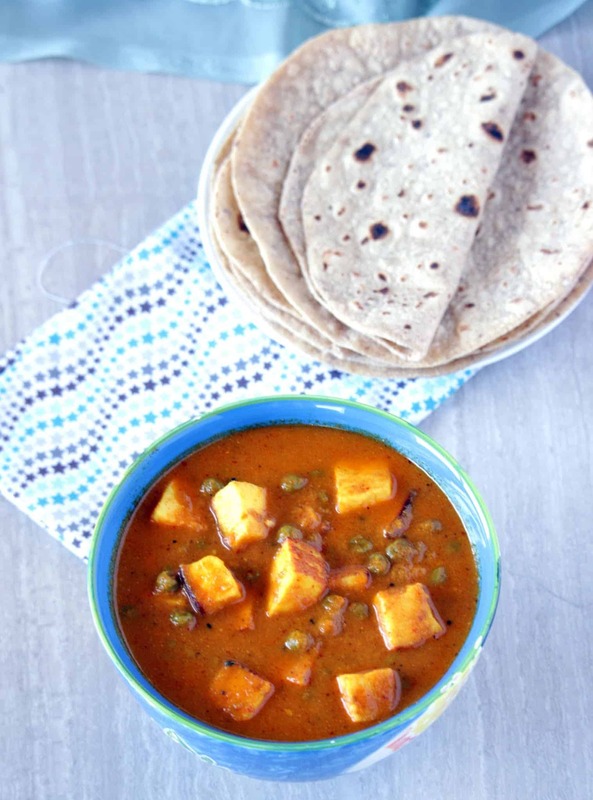 The main reason for this is that my older one does not appreciate paneer as much as he does tofu. But sometimes a girl has to give it to her cravings as well. 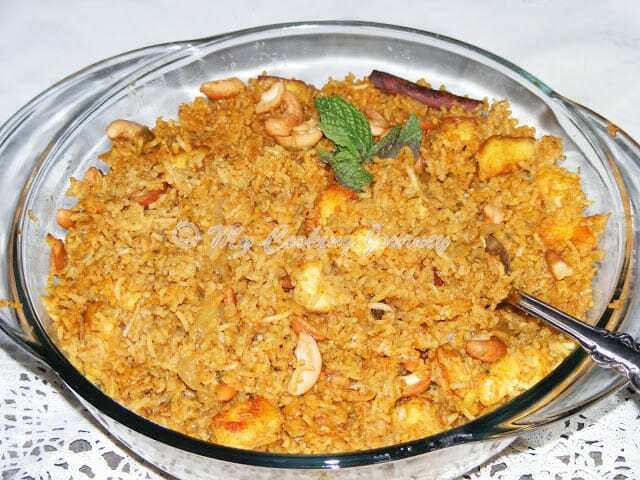 I make paneer pulao or fried rice, but when I came across this recipe, I knew this was going to be a sure hit in my family. 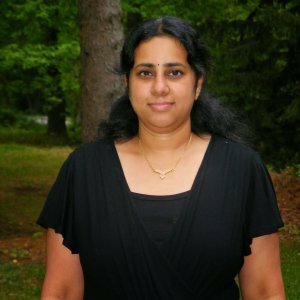 This recipe was passed on to me by my dear friend and senior in college, Sujai. He had posted this recipe pictures and a detailed explanation of the procedure on Facebook and I had to make it right away. The procedure is slightly time consuming, but totally worth every minute spent on it. 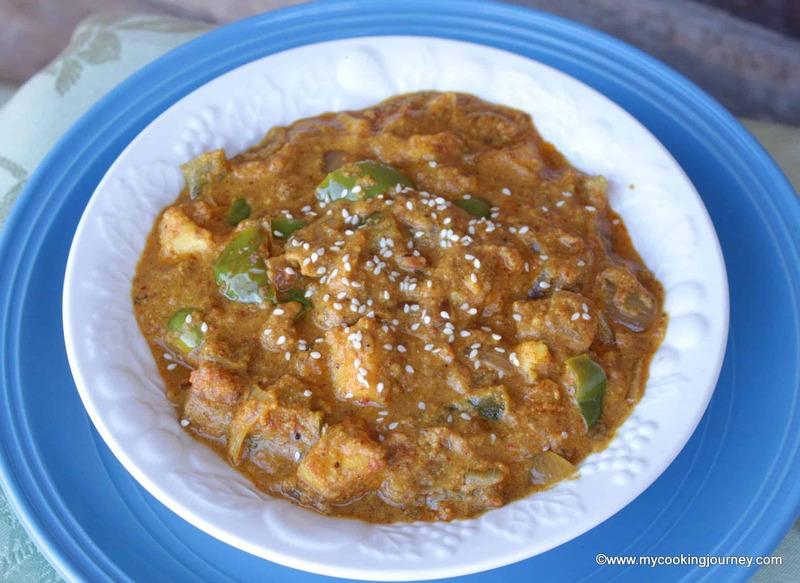 The coconut milk gave a very subtle sweetness to the dish along with the heat from the other spices in the dish. So I chose this recipe as my first one under the theme Main Courses for the second week of BM. Surprisingly my son did not miss his tofu and he actually mentioned that he is starting to like paneer ( I should have recorded that as a proof). So this recipe goes to my box of keeper recipes. 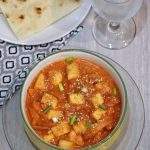 Thanks Sujai for an awesome recipe that made my paneer hater kid into a kid who would try out more dishes with paneer. 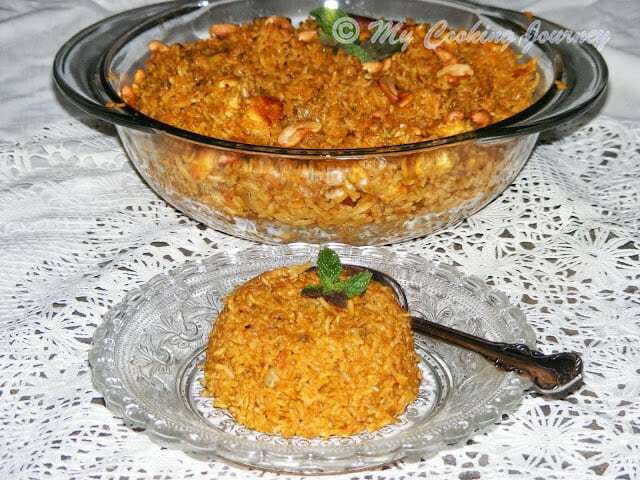 The recipe involves cooking the gravy separately and then preparing the rice separately. Then they both go in together to cook as one. 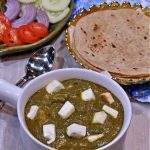 *To make the mint paste – grind ¼ cup of mint leaves with ¼ cup of cilantro and 2 green chilies to a smooth paste. 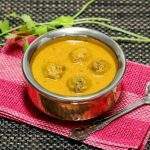 **Cashew onion paste – Soak 6 cashews in hot water for 5 mins. 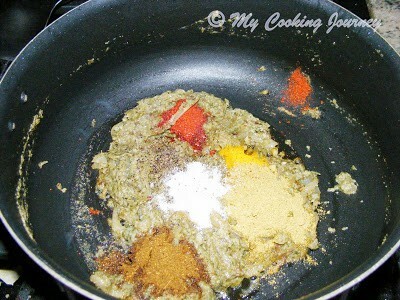 Grind this with 1 small onion, 1 inch ginger piece and 4 garlic pods into a smooth paste. 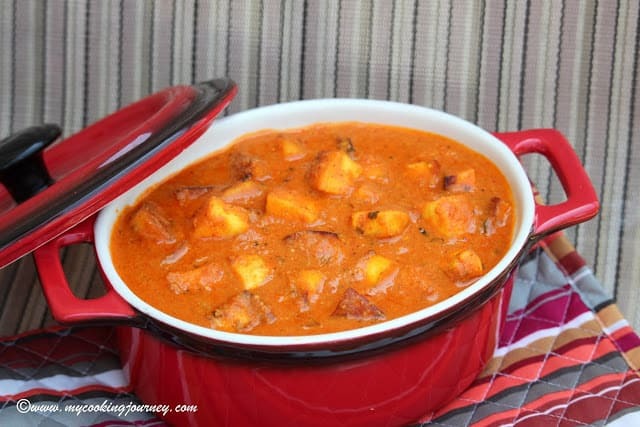 In a pan add about a tbsp of oil and add the diced paneer pieces and fry until it turns light brown, Drain it on a paper towel and keep aside until needed. 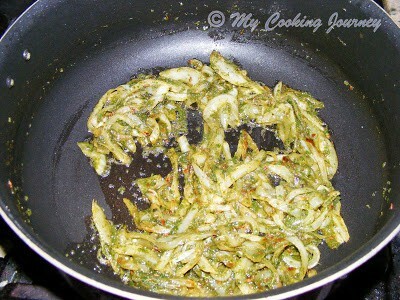 In the same pan, add butter or ghee. When hot add the cumin seeds. 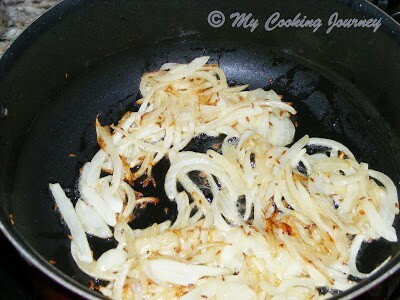 Once the seeds splutters add the sliced onions. Sauté until it turns pink. Now add the mint paste. Sauté until the raw smell leaves (about 5-6 mins). 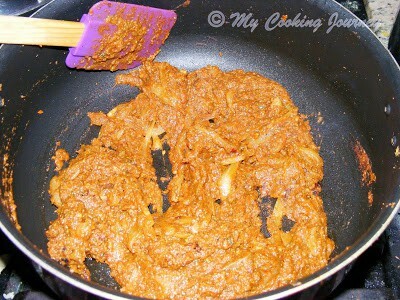 Then add the cashew onion paste. Fry it well (for about 10 mins). Sprinkle little water if needed. Add the tomato puree and salt to taste and mix well. 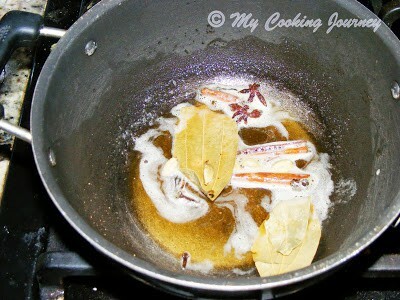 Close the pan and cook the gravy until the oil leaves the sides of the pan. This could take about 10-12 mins. 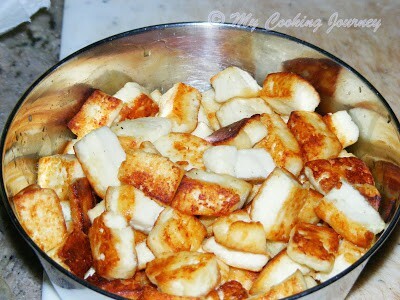 Now add the fried paneer pieces to the gravy and mix well. Cook until the gravy thickens. Wash and soak the rice in water for at least 10 mins. Drain it and keep aside. 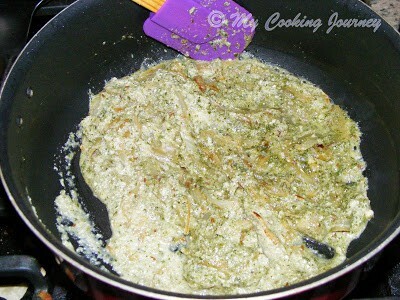 In a pan add the ghee or butter and when hot add all the spices. 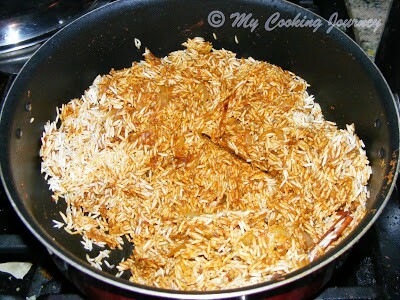 Once the spices are fried, add the soaked and drained rice. Fry in low flame until, all the moisture disappears. 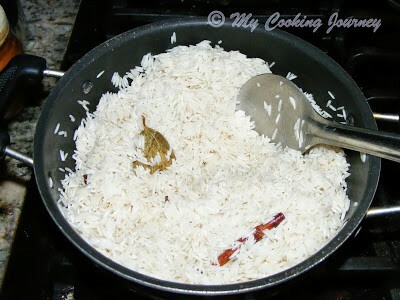 If cooking on stove top (this is what I did), transfer this rice into the pan with the gravy and give it good mix. Add the coconut milk and water (I added about 3 cups of water). Check for salt and then cook covered until the rice cooks. Fluff it with a fork and then serve hot. 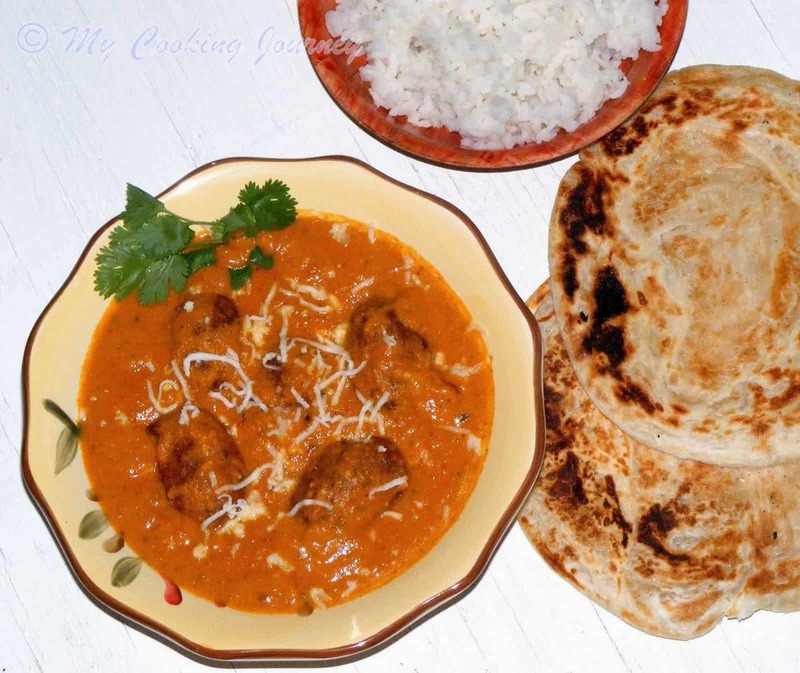 If cooking in a rice cooker, add the rice, gravy, salt (if needed), coconut milk and water needed to the cooker and then cook until the rice is done. Garnish with fried cashews and raisins and serve hot. Wow.. looks too luvely, like the colour, reserved for week-end! 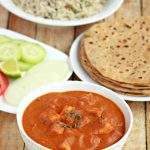 Looks very tempting..I too love paneer in any form! 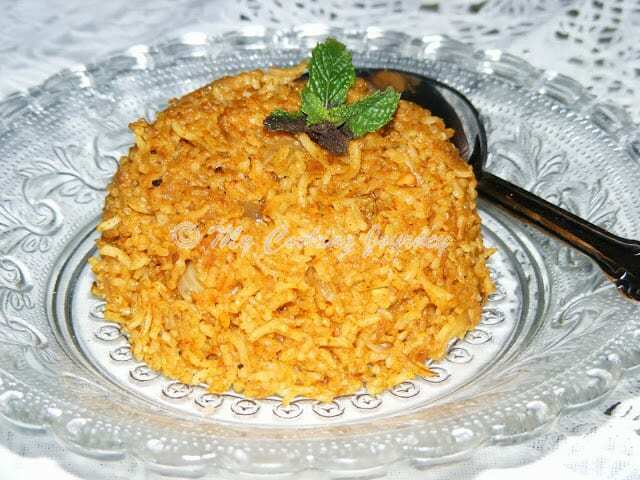 Paneer is our family favourite, can sit and have anything with paneer..Pulao looks inviting. 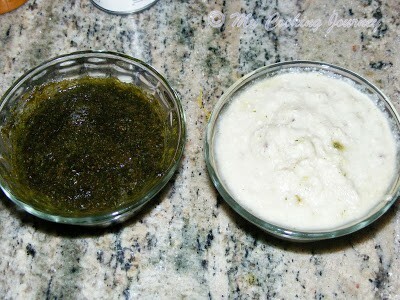 That looks like a very falvorful dish with the mint and the cashew paste.. Will give this a try.. yumm!! 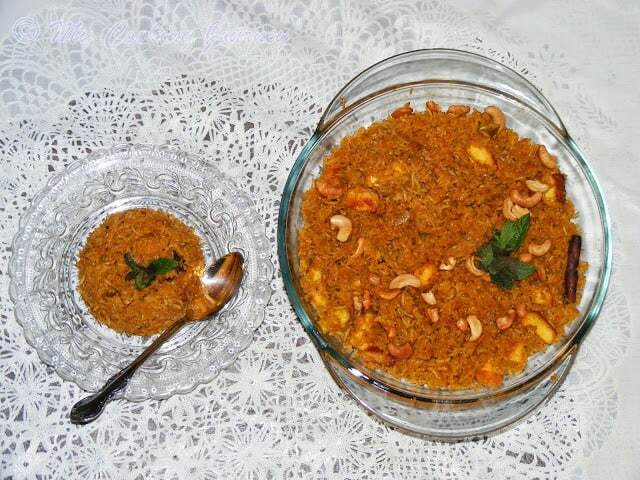 Tempting recipe and Sure it would taste awesome because of cashew onion paste..Bookmarking it.. Adding mint and cashew paste is something new to me. Fantastic this one is. 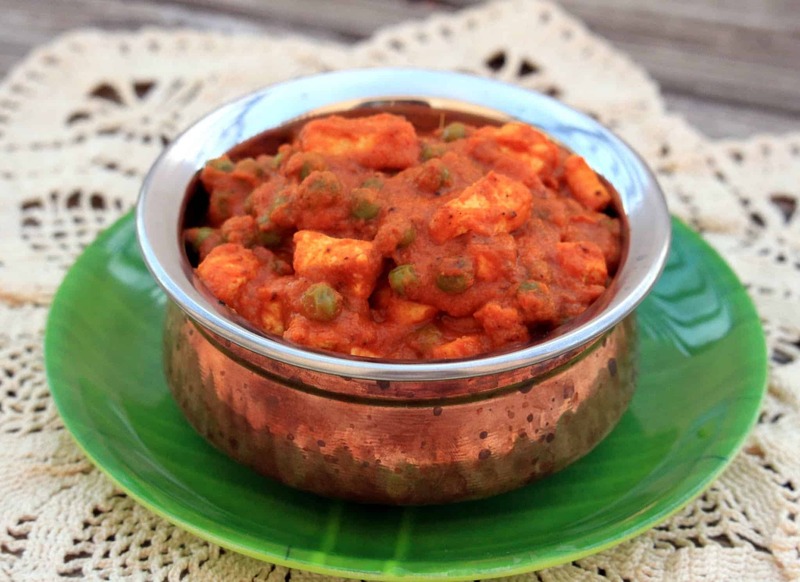 I love paneer and your pulao looks amazing. Bookmarking to try soon!